Reasons for Buying Wireless Speakers for TV? What if Your TV Doesn’t Feature Bluetooth? Are Wireless Speakers Better Than Wired? Are Wireless Speakers Truly Wireless? If you’ve been searching for an easy way to improve the sound of your TV, you have come to the right place. Our article on 10 best wireless speakers for TV is designed to help you understand all the important things you should know about wireless speakers and to offer you some choices. Most of the TVs today, even those ultra HD and 4K TVs don’t really offer great listening experience. The picture might be perfect but the sound doesn’t really match the quality of the picture. If you are one of those people who are not happy about the sound coming from your TV and you want some hustle-free solution, wireless TV speakers are probably the most elegant one. Wireless technology has been present for quite some time and it became very popular all over the world. It all started with mobile phones – people loved the convenience of having a device without wires. The introduction of Bluetooth technology made it possible to make wireless headsets and headphones. Their popularity also went over the top and enabled further implementation of Bluetooth technology. Since Bluetooth connection was such a convenient way of transferring sound, the only normal thing was to start making wireless speakers. After Bluetooth, we’ve got Wi-Fi and some manufacturers (like Bose, Google, and SONOS) started making Wi-Fi speakers. Today, we have all kinds of wireless speakers for different purposes – we have small portable wireless speakers, large party speakers, waterproof wireless speakers that you can use in the shower, multiroom speakers, wireless speakers and soundbars for TV, even wireless home theater systems. There are a few reasons for buying wireless speakers for TV that we can think of. Some people might need additional speakers simply because they have some kind of hearing impairment or age-related hearing loss. Those people usually choose headphones over speakers but if you don’t want to have them on your head all the time, portable wireless speakers are a great solution. You can place your wireless (RF, Bluetooth, or Wi-Fi) speaker near you while watching TV and hear everything loud and clear. Some wireless speakers for TV can even be considered hearing aid devices. In some cases, wireless speakers feature voice enhancement software in order to make all the dialogues clearer for people with hearing issues. Even if you are not hard of hearing, you can make use of these devices. The first three places on our list are reserved for this kind of devices. Other people are simply not happy with their TV speakers and they need something that would fill the room with sound, something that would bring more immersive listening experience, especially when watching movies and TV series. If you are one of those people, you should know that all the other speakers on this list are meant for you. You will find there a lot of soundbars and bookshelf speakers with Bluetooth and/or Wi-Fi connectivity. When it comes to the type of connection, the situation with wireless speakers for TV is very similar to wireless headphones for TV. Basically, there are three types of connection – Radio Frequency, Bluetooth, and Wi-Fi. RF speakers, just like RF headphones, use radio frequencies (different than radio frequencies used by Bluetooth and Wi-Fi devices) to receive the sound. Along with the RF speaker, you will always get a base that works as a transmitter and as a charging station. That base has to be connected to your TV through some of the available audio output ports (usually AUX or RCA OUT) and it has to be powered (have to be plugged into a wall socket). The good thing about RF speakers is that they don’t cause any sound delay (some Bluetooth and Wi-Fi speakers might cause that annoying sound lag). The bad thing is that there shouldn’t be many obstacles between the transmitter (base) and the receiver (speaker). It is not absolutely necessary for the base and the speaker to be in line of sight – RF signal will go through one or multiple walls, but it will get much weaker and the reception won’t be great. You probably know much more about Bluetooth than about RF speakers since Bluetooth is omnipresent and more popular technology. You won’t have to use dedicated base (transmitter) with Bluetooth speakers since your TV will work as a transmitter (if it features Bluetooth and if you decide to connect them wirelessly). The bad thing about Bluetooth connection is that all the audio transmitted via Bluetooth has to be compressed. Because of this compression, you won’t get perfect audio quality and, even more important, you might experience some sound delays (or lags). This is the most annoying thing about Bluetooth speakers but there’s a simple solution for that issue – find a Bluetooth speaker that supports aptX low latency. This is a special way of compression that causes an imperceptible sound delay (below 40ms). There is no way to completely eliminate audio delay but making it imperceptible is good enough for most people. Having a Bluetooth speaker that supports aptX low latency isn’t the only precondition. You also need a TV that features Bluetooth and support for aptX low latency. Most of the manufacturers recommend using one of the digital (or even analog) INPUT/OUTPUT ports to connect your TV to your wireless speaker and use the Bluetooth feature to stream audio content from other Bluetooth-enabled devices (phones and other Apple, Android, and Windows devices). You can use a Bluetooth connection to pair your TV with your speaker (soundbar) but you have to know that sound won’t always be in sync with the video. Bluetooth speakers and soundbars are the most common type of wireless speakers for TV and most of the products on our list use a Bluetooth connection. Wi-Fi speakers for TV are the next big thing when it comes to wireless audio. Wi-Fi speakers are more often used for making multiroom systems but there are some manufacturers (like SONOS) that make even Wi-Fi home theater systems. Wi-Fi speakers are not completely wireless and you will usually have to connect your TV to one of the speakers (or to soundbar) through some of the available digital or analog ports, and that speaker is going to stream the sound via your home Wi-Fi network to other speakers. The thing with Wi-Fi speakers is that when you buy one brand, you have to stick with that brand from then on. So, if you buy SONOS soundbar first and then decide to make an upgrade, you can’t buy any wireless speaker – it has to be SONOS wireless speaker (PLAY:1, PLAY:3 or PLAY:5). The same goes for any other brand – the fact that all the speakers use the same Wi-Fi network is mandatory but it isn’t the only condition for them to work together. They have to be compatible, too (they have to be made by the same manufacturer or, in some cases, they even have to be from the specific line of products made by the same manufacturer). Since Bluetooth is the most popular and most affordable technology when it comes to wireless connection, most of the wireless speakers on the market are, in fact, Bluetooth devices. In order to pair your TV (or any other device) with your speakers, you need a TV that has a Bluetooth. If you don’t have a Bluetooth-enabled TV, there is a simple workaround but it will cost you a little bit. You will find a bunch of small devices called Bluetooth transmitters (or transceivers) on the Amazon and you can buy one for $25-$60. You just need to pick one of those with aptX low latency support. Some of the most popular transmitters/transceivers on the market are TaoTronnics TT-BA07, TaoTronics TT-BA12US, TaoTronics TT-BA09, Avantree Priva IIA. You can also make some of your old wired speakers wireless by using Bluetooth receiver (or transceiver) for the speakers (it also has to support aptX low latency) and Bluetooth transmitters (or transceiver) for your TV. In most cases, this will be a cheaper option than buying wireless speakers. If you really want to buy a wireless speaker and not to make your old wired speakers wireless, we have made a list of 10 best wireless speakers for TV. We’ve tried to include all kinds of speakers (Bluetooth, Wi-Fi, RF) from different price ranges and with different features. Hopefully, you will find something interesting here. Serene Innovations was established in 2002 in California but their products are engineered and manufactured in China. Serene Innovations does not make only audio equipment but all kinds of electronic devices for people with different disabilities (for those who are hard of hearing, for those with low vision or with limited mobility). Some of their most recognizable products are amplified phones, loud ringers, and TV speakers. TV-SB wireless TV speaker is one of their all-time bestsellers. It’s one of those speakers that can be considered a hearing aid device (we’ve already mentioned that the first three devices on the list are meant for people who are hard of hearing). Its most important characteristics are portability, wireless design, long-lasting battery, satisfying loudness, simple setup process, and pretty good wireless range. Some of the biggest flaws are construction quality, occasional static noise, and price (in our opinion, this speaker is overpriced). TV-SB speaker by Serene Innovations comes in a simple box with all the important things you need to know about the speaker written on it. Inside the packaging, you will find TV-SB wireless speaker (receiver), base (this base is charging dock and a transmitter at the same time), one AC adapter for the base, a set of cables (2 RCA Y-adapters and an audio cable), and 1-year warranty card. Depending on the type of TV you have, you might need additional equipment to make things work. There are only two types of inputs on the back side of the base – RCA and AUX. If your TV doesn’t have any of these ports (and some newer TVs don’t really have these ports), you will have to use some of the digital outputs (digital optical or coaxial) on your TV to make the connection. The fact that you have to use digital outputs means that you will have to buy one additional digital optical (or coaxial cable) and DAC device (Digital-to-Analog Converter). If you decide to buy this equipment from Serene Innovations, you will have to pay additional $40. You might also want to buy an AC to DC 9V power adapter for the speaker since there is only one AC adapter for the base in the box (if you are in the middle of the movie and you get low battery warning, you can attach this cable to the speaker and power it through the adapter). The speaker itself is really small (9 inches wide, 7 inches tall, 3.25 inches deep, and it weighs 1.7 pounds). There is only one version available – black with a silver protective grille on the front side. The speaker is completely made of hard plastic. It seems strong and very compact. There is only one control knob on this speaker and it’s on the front side, right in the middle of the speaker – you can use it to turn on/off the speaker and control the volume. There are also two led indicators on the front side – battery/charging indicator and ON/OFF indicator. The greatest part of the front side is covered with that grille that protects two 5W drivers (and 2 class-D amplifiers) On the left side, you will find TONE switch (there are three available positions – HI, MED, and LO and you can use them to adjust or enhance certain frequencies depending on your preferences), AUX input (you can use this port to connect the speaker to your TV or to any other audio source (phone, tablet, PC) through AUX cable if there is some problem with wireless connection), headphone output (in case you don’t want to disturb others with the sound, you can connect any wired headphones to the speaker), and DC input (in case you buy that AC to DC adapter you can power the speaker if the battery is running low). At the bottom, there are charging contacts and a pairing button. The base is really simple and it’s made of plastic. On the top of the base, there are two bulges with charging contacts. On the back side, you will see two RCA inputs, AUX input, pairing button, and DC input. 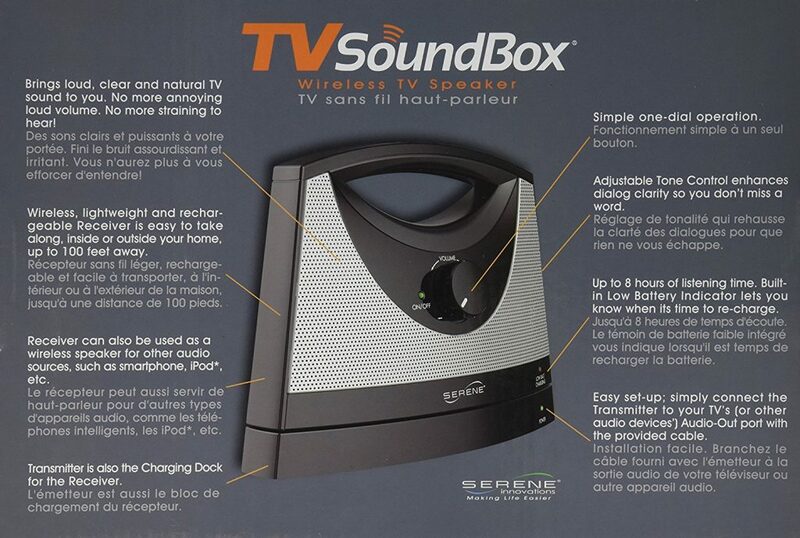 TV Soundbox is really simple to install and use. You just need to connect the base to your TV with one of the cables from the box (or those digital optical or coaxial that you bought separately) and plug the adapter into the wall outlet. After that, you have to turn the speaker (receiver) on and press the pairing button on the base and on the speaker. Pairing takes just a few seconds and after that, you can use the speaker. Speaker’s volume controls are independent of your TV volume so you can mute your TV speakers, put TV Soundbox right next to you or in front you, choose the TONE mode you prefer and you are done. One base can transmit the signal to multiple speakers (up to 50) and you can buy additional speakers for your wife/husband and other family members and you can all use the same base. The greatest thing is that you can bring the speaker with you and never miss a word. The speaker is very lightweight, it has a small footprint, and the range is approximately 100ft so you can take it to the kitchen, to your bedroom, or even to the bathroom and still get great reception. Battery offers a decent amount of wireless listening. It will last for up to 8 hours at 50% volume, but only about 4-5 hours at 100% volume (although, we don’t recommend increasing the volume that high because of a significant amount of distortion). Sound quality is satisfying considering the size of the speaker, but considering the price, the sound is kind of tiny (if you are paying more than $100 for only one speaker, you are expecting it to sound better than that). TONE modes will improve the listening experience for people who are hard of hearing. You can enhance a certain range of frequencies and put an emphasis on dialogues, for examples. The speaker is also quite loud for its size but you shouldn’t increase the volume above 80-85%. They say that the beauty is in the eye of the beholder but we still think that Serene Innovations should make some improvements regarding the design. This thing looks like a purse and not a pretty one. Considering the price, this speaker is not durable enough. The housing itself is not an issue (even though it is made of plastic), but there is rather kind of mechanical or software issue. A certain number of customers (maybe some 5% of them) experienced battery issues and had troubles connecting the speaker to the base. Another annoying thing is that there is a small amount of static noise at low volumes and it will disappear only if you increase the volume above 50%. We should also mention the fact that the base uses 2.4GHz frequency to transmit the audio signal and it might interfere with your Wi-Fi network. If you have a dual-band wireless router, you can avoid any interference by using 5GHz frequency for your Wi-Fi devices. If your router works only on 2.4 GHz, you may experience some issues. Having in mind all that we’ve said, we can’t help but notice that this product is overpriced. In our opinion, it should cost no more than $80. Pyle is much more familiar name than previously mentioned Serene Innovations. It’s one of the oldest American audio equipment manufacturers and it’s been making all kinds of speakers, amplifiers and other electronic devices (for everyday and professional use) for decades (since the 1960s). Pyle is one of the companies that makes hearing assistance devices for TV. Pyle Wireless TV Speaker is that kind of device and it is one of the most popular and highly rated speakers of this kind. This speaker is very similar (in terms of performance) to previously mentioned Serene Innovations wireless TV speaker. The greatest differences between these two speakers are the size of drivers and the design. The speaker comes in a small and lightweight box. The packaging does not look impressive or expensive and you won’t be amazed by it. Inside, you will find the speaker (receiver) that looks like an old-fashioned radio, a transmitter (which is also a charging dock), AC adapter, a set of cables (one auxiliary cable and one 3.5mm to RCA cable), user manual, and 1-year warranty card. The transmitter has only one input (3.5mm port) and you will have to use RCA audio OUT ports or headphone OUT port on your TV to connect the base to the TV. If your TV doesn’t feature any of these ports (some newer TV devices have only digital inputs and outputs), you are going to need some digital optical (or coaxial cable) and DAC device in order to connect everything properly. Also, if you want, you can buy an additional AC to DC adapter for the speaker (you will only get one for the base). This cable is not necessary and the speaker is able to work without a cable (it’s battery-powered) but in some cases it’s useful to have a backup option if the battery dies and you are in the middle of some TV show (and you should know that your speaker has DC input so you don’t have to use the battery). The speaker, as we have already said, looks like those old portable radios. Considering the fact that this product is designed for seniors, Pyle probably wanted to make the product visually appealing to its target group. The speaker is completely black with black grille on the front and on the rear panel. There is also a strong plastic handle on the top. The speaker is 8.5 inches wide, 8 inches tall, 2.9 inches deep, and it weighs 2.8 pounds. Its dimensions and weight, along with great range make it highly portable. Just like Serene Innovations wireless speaker, Pyle speaker has only one control knob (this knob is at the same time ON/OFF and volume knob) and it’s on the left side of the speaker. On the rear panel of the speaker, there are DC input, headset output, 3.5mm audio input port, and TONE switch (with two modes – MUSIC and MOVIE), and pairing button. Charging contacts are located at the bottom of the speaker. Inside the speaker, there are two 3W speakers with class D amplifiers. The transmitter base is made of plastic and it’s very lightweight. On top of it, there are two bulges with charging contacts on the left bulge. All the ports are on the back side. You will see DC input, 3.5mm audio input port, and pairing button. There is one LED power indicator on the front side of the base. 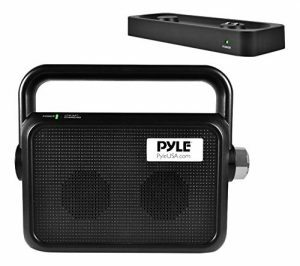 Pyle wireless speaker is quite easy to set up and use. There is nothing difficult about the setup process if your TV has RCA OUT ports or headphone OUT, but if it doesn’t you will need additional cable and a DAC device. Pairing the speaker with the transmitter is quite simple and quick – you just have to press pairing button on both devices and everything else is done automatically (you don’t have to press them simultaneously – turn on the speaker first and press pairing button until the power indicator starts blinking and then press the pairing button on the transmitter. The audio will start playing in a few seconds). The range is approximately 100ft which is great for walking around the house with the speaker. You can bring it with you to any room and never miss a single word of your favorite show. Just like with Serene Innovations TV Soundbox, you will be able to pair up to 50 speakers with only one base and play the same audio on all of them (great expansion abilities). Battery offers up to 8 hours of listening time at moderate volume and significantly less at max volume (approx. 4 hours). Pyle wireless speaker will go to standby mode if there is no transmission for three minutes in order to preserve the battery (in case you turn off the TV and forget to turn off the speaker). This speaker performs slightly worse than Serene Innovations. Sound quality is not perfect, high frequencies are muffled at high volumes, lows are not punchy enough but all the voices are loud and clear and that’s the most important thing considering the purpose. You will have two TONE modes at your disposal. There is a noticeable difference in sound between MUSIC and MOVIE mode and it depends on your preferences which mode you are going to use. Pyle wireless speaker for TV offer slightly worse sound then Serene Innovations TV Soundbox, but it’s much cheaper than Serene and offers better price-quality ratio. This speaker is not as loud as Serene Innovations TV Soundbox and that’s one of the features that should be improved. A certain number of users complained about speaker’s durability. In most cases, the speaker simply stopped playing any audio after six months or so. Considering the number of people that are happy with this device we can’t really say this is a common issue and you will always have that 1-year warranty in case something happens (unless you break the speaker or the base). The base also uses 2.4GHz radio frequency to transmit the audio and if your wi-fi router uses the same frequency, there might be some interference. The next speaker comes from the company called TV Ears. This is another Californian company. It was established in 1998 and, since then, they’ve been making hearing aid and voice clarifying devices (headphones and speakers) for TV. TV Ears wireless speaker is the most expensive of all hearing aid speakers for TV we’ve reviewed, and to be honest, we think that paying almost $200 for such a small speaker is a bit too much. The best thing about this speaker and the thing that makes it so expensive is voice clarifying technology that enhances voices and dialogues and reduces all the other noises and music making it much easier for people with all kinds of hearing impairment to hear the dialogues loud and clear. The speaker comes in a nice branded box with different illustrations and all the important features written on it. The packaging is not premium but it’s decent. Inside the packaging, there are one speaker and one infrared transmitter (this transmitter can be used as a charging station for TV Ears headphones but they are not included in the price and you will have to buy them separately), two power adapters (one for transmitter, the other for the speaker – speaker is not battery-powered and has to be plugged in all the time), a set of cables (3.5mm to 3.5mm auxiliary cable, 3.5mm to RCA, and digital optical cable), user manual, and 5-year warranty card. The speaker weighs 3.5 pounds, it’s 10.75 inches wide, 6.5 inches high and 4.5 inches deep. Even though it’s not that heavy, it is not portable because you have to keep it plugged in (which is a downside if you compare it to previous two speakers). Inside the speaker, you will find two full-range drivers with two small bass ports. On the front side of it, there is only one knob (you can use it to power on/power off the speaker and control the volume). Right above the knob, there are two headphone outputs for private listening. On the top side of the speaker, there is a small circular disc. This is actually a receiver and, since the speaker receives the signal through infrared technology, you have to make a clean line of sight between the receiver and transmitter. On the rear panel, you will find two input ports (one for power, the other (3.5mm port) for any external audio source) and one bass knob (so you can adjust the bass to your preferences). The transmitter is even lighter and smaller – it weighs only 3 ounces, it is 4.12 inches wide, 3.4 inches deep, and 1.4 inches high. On the front side, there is a bunch of diodes. The most of them are infrared diodes. The first green on the left side is charging indicator, the second green is an analog audio source indicator, and the red light is a digital audio source indicator. On the top of the transmitter, there are two charging cradles for TV ears headphones (you can buy them separately if you want). All the ports are at the back – digital optical input, coaxial audio input, 3.5mm input, and DC input port. The installation process is pretty much the same as with previously mentioned speakers. The only difference is that you have 2 digital inputs on the transmitter. If you have a new TV, the digital connection is always preferred. If your digital optical audio outputs are already reserved for some other devices, you can use analog outputs on your TV (RCA OUT and headphone OUT) and analog 3.5mm input on the transmitter. After you connect the transmitter to your TV, you just have to plug in the transmitter and the receiver and they are paired. There is no pairing button or anything else. Speaker will start playing audio almost immediately. The manufacturer recommends muting the volume on your TV while watching it. If you don’t, you will hear that annoying echo all the time. Speaker is very simple to use – after all, there is just one volume knob on the front side and one bass knob at the back. Voice clarifying feature is quite good. Music and background sounds are really diminished, but it all sounds a bit strange at first. You will probably need some time to get used to this new kind of sound. It’s not really easy to talk about the sound quality of something that’s not intended to sound natural. Let’s just say that this speaker works as advertised. This speaker doesn’t come with a remote and that would be a nice addition to the package. You should get a remote for that kind of money. 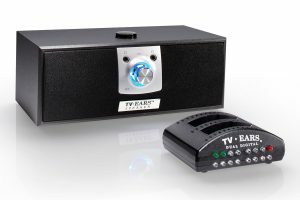 Unlike previous two hearing assistance TV speakers, this one is not powered by a battery and you can’t wear it around your house and listen to your favorite TV shows while cooking, resting in your bedroom, etc. This speaker is not really wireless since it has to be plugged in all the time. Also, the speaker and the transmitter have to be in line of sight and if someone or something blocks a signal by standing between these two devices, the audio will stop playing. Many customers complained about those bright lights (diodes) on the transmitter. They don’t turn off ever and they can be quite distracting. Some users also complained about the loudness. Honestly, this speaker is not as loud as Serene Innovations wireless speaker, but it does a better job at isolating background music and enhancing voices and dialogues. Considering all the upsides and downsides, we think that this product is a bit overpriced. SONOS is one of the visionaries in the field of wireless audio. It has been part of the audio industry for less than 2 decades and, in that time, SONOS has become one of the most popular brands when it comes to wireless (Wi-Fi) speakers, soundbars, and home theater systems. To be honest, there is not much competition in this field – there are only a few manufacturers worth mentioning that make this kind of speakers and manage to maintain certain quality (Bose, Denon, and a few more). Still, SONOS is probably the most reputable and recognizable brand. When someone says wi-fi or multiroom speaker system, the first name that comes to mind has to be SONOS (at least, for the majority of people). The device we want to present to you is SONOS soundbar called PLAYBAR. This is probably one of the top three speakers on this list in terms of sound quality (the first three products on the list are not comparable to all the others since they are classified as hearing assistance devices). Unfortunately, SONOS PLAYBAR is also one of the most expensive ones. Some of the best things about this soundbar are great sound quality and clarity, fashionable and attractive design, wi-fi connectivity (and with wi-fi connectivity comes compatibility with Amazon Echo and Alexa, and with bunch of streaming services and internet radio stations), possibility of expansion to 5.1 home theater system (Dolby Digital 5.1 surround sound format is supported), ease of use, and some additional modes you can activate via SONOS app (like Night Mode and Dialogue Enhancement). Downsides of this PLAYBAR are the lack of support for DTS surround sound formats, the fact that you have to use SONOS app to stream anything, and unimpressive bass-response. All the SONOS speakers come in a premium packaging and PLAYBAR is not an exception. You will get a nice-looking box with all the important things you need to make it work (including cables). You will find there your soundbar, power cable, digital optical cable, quick start guide, and a warranty card. If you want to mount it on the wall under your TV, you will have to buy wall mount kit separately (not included in the package). The PLAYBAR is not too heavy, but it’s not light either. It weighs almost 12 pounds, it is 35.4 inches wide, 3.4 inches tall, and 5.5 inches deep. It looks quite compact and durable, and it is also very stylish. The most of it is black and there is only nice silver strip with SONOS logo on the front side. There is only one IR sensor on this side and it will light red when you increase or decrease the volume. There are only three control buttons on the right end of the soundbar – play/pause/mute button and two volume buttons along with LED status indicator (it will be solid white when the soundbar is on and working properly, you will see flashing white light during boot up, solid green when muted, flashing green when the soundbar is ready for setup, solid orange if it’s overheated, alternating between orange and white or if it’s flashing green it means that there is something wrong with the unit (probably overheating), if you get flashing white and green it means that your product hasn’t been registered, and if you get flashing red and white it means that the update wasn’t successful). On the back side, you will find all the input ports. There are no many of them – you will get one digital optical input (to connect your TV to the soundbar), two Ethernet ports (one for connecting the soundbar to your router and the other for sharing wireless control – you are probably not going to need both), and AC input. SONOS speakers, as well as this soundbar, are among the best-looking audio devices on the market, and when it comes to design, we think that there is probably no one who wouldn’t like this kind of simple and stylish look. The soundbar is very simple to use. You can control the volume through those buttons on the unit itself, but you can also use your TV remote (you just have to follow the instructions from the user manual), or your SONOS app that you have to install on your phone or tablet (both Android and Apple devices are supported). Setup takes some time but it’s actually really simple and you just have to follow all the steps to connect the soundbar to your home wi-fi network. The soundbar has to be connected to your TV through a digital optical cable which kind of ruins wireless nature of this device. It also has to be connected to your router through Ethernet connection if you want to add more speakers and make 3.1 or 5.1 home theater system. You have to do this if you don’t want to use SONOS bridge (this is option No2 and it’s more expensive). You need a wired connection between your router and PLAYBAR in order to make a dedicated network for SONOS devices (you can read about this BOOST setup on SONOS website). If you are not planning to add another device (SUB or some of the SONOS speakers – PLAY:3 or PLAY:5), and you don’t need shared wireless control, you don’t have to use the Ethernet connection. The PLAYBAR is able to connect to your home Wi-Fi network wirelessly. 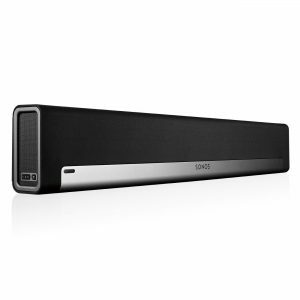 The great thing about this soundbar is that it allows expansion to a real home theater system by adding a subwoofer (SONOS calls it simply SUB) and/or two PLAY:1, PLAY:3 or PLAY:5 speakers. So, if you like SONOS devices and you don’t have enough money for all of them at once, you can buy each unit separately (start from PLAYBAR and then make upgrades). This system will support Dolby Digital 5.1 surround sound format and you will be able to enjoy incredible cinema-like sound but it will cost you (cumulatively) a lot. There are definitely some cheaper wired options and even some better equally expensive options but if you are a fan of wireless technology, there is no better option than this SONOS system. We also have to mention two additional modes that you can activate from the SONOS app – Night Mode and Dialogue Enhancement (this one could even make this soundbar a hearing assistance device). The first mode will make your late-night TV watching at low volumes more pleasant by enhancing the volume of quiet sounds and lowering the sound of explosions. The second mode will improve certain frequencies (voices and dialogues) and diminish the volume of all the other frequencies and sound effects. You can also stream any content (music and podcasts) from all of your devices connected to your home wi-fi network but you have to use some of the supported applications (there is more than 80 supported applications – Deezer, Spotify, Pandora, Napster, Tindal, etc.). Unfortunately, you won’t be able to stream the music directly from your phone storage (only from those apps). The PLAYBAR offers pretty good listening experience. This soundbar features 9 drivers (6 full-range woofers and 3 tweeters). Dialogues are quite clear (and even clearer with Dialogue Enhancement mode activated) as well as highs. There is practically no noticeable distortion even at maximum volume. The first and the most important thing we don’t like about this unit is the bass response. Bass is simply not punchy enough and you are going to need a subwoofer to make it sound better (and it has to be SONOS SUB). We’ve had the opportunity to test the sound with and without bass unit, and everything sounds much better with the subwoofer. The soundbar doesn’t support any of DTS surround sound audio formats and if you buy any of those upgrades (SUB or SONOS speakers) you won’t get much use of these upgrades when playing some Blu-ray video with DTS surround sound. You all know about BOSE. It’s been one of the biggest players in the audio industry for more than 5 decades and it has a huge fan base, especially in the US. It was founded in Massachusetts in 1964 by one of the MIT professors Amar Bose. Today, the majority of shares of BOSE company is owned by the MIT but MIT is not allowed to manage the company, make business decisions or sell its shares. BOSE is famous for making high-end speakers (portable, multi-room, home theater systems, and stereo speakers), headphones (noise canceling, wireless, sports headphones, etc. ), and car audio systems. For some people, BOSE is a synonym for high-end audio but there is a certain number of audio enthusiast and audiophiles that don’t really appreciate BOSE products and policy (and that’s an understatement). This review is dedicated to all of you who like BOSE speakers, their performance, and simplicity. 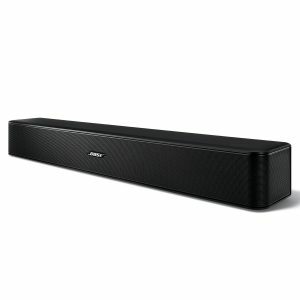 We have decided to present to you BOSE Solo 5 soundbar. This is an entry-level speaker. The price doesn’t really imply that since it costs almost $250 but this is not a speaker that will blow you away. It’s more like something that you can use to slightly improve the sound of your TV if your room is not big enough for something stronger (bigger) or for home theater system. It is one of the smallest soundbars on the market. The best thing about this speaker has to be the sound clarity, specifically the dialogue clarity. There is even dialogue enhancement mode that you can turn on if you are having difficulties hearing all the dialogues clearly. The worst thing about it is the reproduction of low frequencies. This soundbar simply doesn’t offer enough punch even if you are not crazy about the bass. Like all the BOSE products, Solo 5 comes in a premium box, nicely packed and protected. Inside the box, you will find your soundbar, a universal remote with 2 AAA batteries (you can use that remote not only for the soundbar but also for your TV, Blu-ray or DVD player), power cable, digital optical cable, user manual, and 1-year warranty card. The speaker looks quite minimalistic but very stylish. It’s completely black. The front side is covered with black aluminum grille with BOSE logo in the middle of it. Behind the grille, you will see two full-range drivers (located right in the middle) of the cabinet and two LED indicators on the left side (status and Bluetooth indicator). The rest of the soundbar is made of hard plastic. There are no control buttons of any kind on the soundbar itself and you will have to use the remote that comes with it to control everything. All the inputs are at the back. There are AUX input, digital optical, and coaxial inputs (digital optical connection is preferred). There is also a power input and a USB port (can’t be used for music playback, only for firmware updates). The soundbar can be placed on the table under your TV or mounted on the wall. As we have said previously, this thing is quite small – it is 21.6 inches wide, 2.6 inches high, 3.4 inches deep, and it weighs 3.7 pounds. The remote, unlike the soundbar, looks quite bulky but that’s because you are supposed to use it for all of your devices and not only for the soundbar. First, there is that loveable minimalistic design. Today’s audio equipment becomes more and more complicated with a bunch of buttons and different modes. BOSE manages to keep it simple and clean. BOSE didn’t put any control buttons on the soundbar and made it look really elegant. Of course, this is only one point of view – some people might actually like having a bunch of control buttons on the soundbar and if you are one of them, you won’t be impressed with Solo 5. Setting up Solo 5 takes no more than 5 minutes. It’s incredibly simple to connect it to your TV – this is basically plug-and-play device. What takes much more time is understanding and getting used to the remote. You can do all the basic stuff (increase and decrease the volume or activate dialogue mode) immediately but if you want to program the remote and use it for your TV (or some other device), you will have to read the manual carefully and follow the instructions. The soundbar features Bluetooth connection and you can stream music from Bluetooth-enabled devices to the soundbar. Pairing is very easy and quick – you have to hold the Bluetooth button on the remote until the Bluetooth indicator starts blinking Blue (it means that soundbar is in pairing mode) and then find Bose Solo 5 in the list of available Bluetooth devices on your phone and pair them. You don’t have to do this every time – the soundbar will remember your device and it will pair with it whenever they are in range. You can pair Solo 5 even with your TV but you can’t use it to watch movies because the soundbar doesn’t feature support for aptX low latency codec and there will be significant sound lag. Bluetooth range is about 30ft. We have already mentioned Dialogue Enhancement mode. You can activate it by pressing the dedicated button on the remote. This mode actually reduces bass frequencies and enhances low mid-range frequencies. And it really works – dialogues sound clearer and louder. There is also bass control button on the remote – you can press it once and then go to + and – volume controls and adjust the amount of bass. When it comes to sound quality, we can’t really say that we were impressed. There is a bunch of cheaper options on the market that sound better (more balanced and accurate) than this Solo 5. 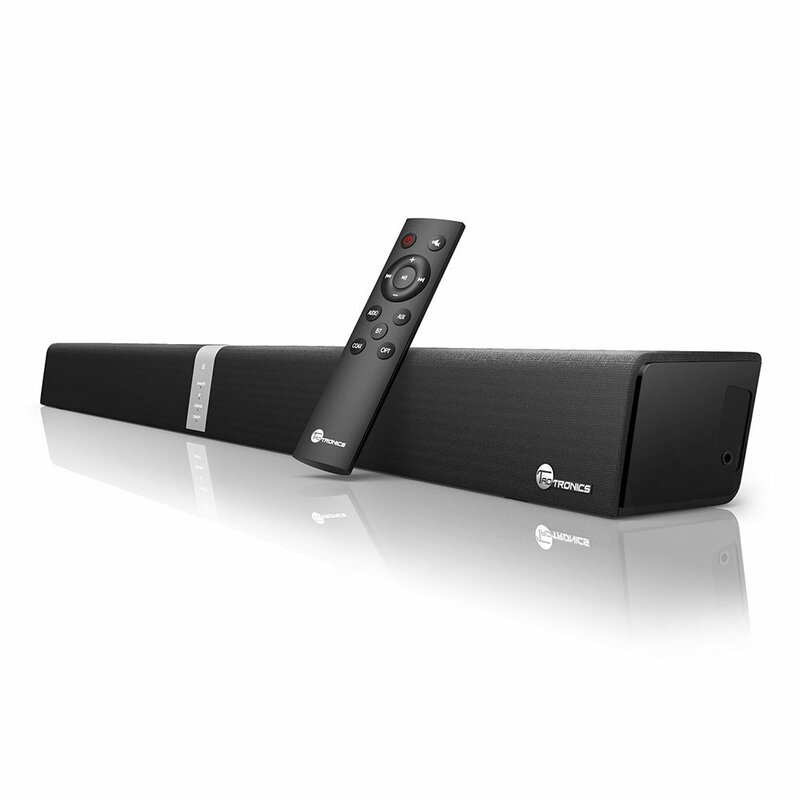 This soundbar excels when reproduction of mid-range frequencies is concerned. Everything from the mid-range sounds pretty good, voices are loud and clear even without Dialogue Enhancement mode but the lack of bass and high frequencies is a bit too obvious. Solo 5 doesn’t create an impressive soundstage. There are only 2 full-range drivers in the middle and that’s not the way to make a wide soundstage or to achieve great sound imaging. This soundbar won’t immerse you in the movie like some bigger soundbars (PLAYBAR or Nakamichi) but it will be good enough for watching TV shows, especially those with lots of dialogues. Solo 5 doesn’t meet our criteria when it comes to bass response. Bass is really weak so don’t expect explosions or special effects to sound good. This is probably the biggest downside of this soundbar. You can slightly improve the bass by pressing the BASS BOOST button but this mode makes everything more distorted. There is one more thing we would like to mention. It’s not really that important but it is annoying. You can’t set the Dialogue mode as default. You will have to activate it every time you turn on the soundbar. When you turn it off and then back on, the soundbar will reset and you will get the default audio mode. Yamaha is one of the most popular brands when it comes to home theater systems, TV speakers and soundbars, and AV receivers. Yamaha offers great sound quality and performance for a decent price. Yamaha products are usually not too pricey and they do tend to offer very good quality for the price. For example, this one is some $50 cheaper than Bose Solo 5 and it performs much better. We have decided to present to you Yamaha’s soundbar YAS-107 with Bluetooth connectivity. This is one of the best soundbars under $200 you could find on the market. Some of the upsides of this soundbar are very good sound quality with built-in ‘’subwoofers’’ (they are not really subwoofers since they are small (3 inches diameter) and for a good bass response you need at least 8 inches), 2 woofers and 2 tweeters, possibility of adding one more (external) active subwoofer, HDMI input and output ports with HDCP 2.2, HDR, CEC, and ARC support, Bluetooth connectivity, simplicity of use, different audio filters and Voice Enhancement mode. The only real downside of this speaker is the bass response and we will elaborate on this later. The soundbar comes in a nice-looking box with Yamaha logo on it. Along with soundbar, you will get a simple remote, one power cable, one digital optical cable, 2 spacers and mounting template that you can use if you want to mount this unit on the wall, micro USB to USB cable, user manual, and a warranty card. The soundbar looks very stylish and elegant. It is made of plastic, but everything is wrapped in some kind of soft fabric that makes it look much less plasticky and maybe more expensive. You can see that it’s made of plastic only if you look at the back (or if you look at bass reflex ports on both ends of the soundbar). The soundbar is 35 inches wide, 5 inches tall, 2.5 inches deep, and it weighs 7.5 pounds. The front side of the soundbar is covered with black fabric. There is a control bar with really small LED status indicators (DD/DTS, DPL, HDMI, TV, ANALOG, BLUETOOTH, SURROUND, BASS EXTENSION, CLEAR VOICE) and touch-sensitive control buttons (SOURCE, MUTE, VOLUME UP/DOWN, POWER ON/OFF) near the bottom. On both ends (left and right) of the soundbar, you will see bass reflex ports. All the inputs and outputs are at the back – you will see power input, micro USB port (for firmware updates), subwoofer output (you can buy subwoofer separately and attach it to the unit – we strongly recommend this considering the bass response of the unit), 3.5mm input, digital optical input, one HDMI IN (you can use it to connect your Blu-ray or DVD player, or gaming console), and one HDMI OUT (to connect the soundbar to HDMI input on your TV). Inside the soundbar, there are 6 drivers – two 2.1-inch woofers (frequency response – 160Hz to 23KHz), two 1-inch tweeters (frequency response – 4KHz to 23KHz), and two 3-inch subwoofers (frequency response – 60Hz to 160Hz), with two bass reflex ports. The maximum output power of the unit is 120W. The design of this soundbar is visually appealing – it’s super-slim, simple, it’s not flashy or distracting, but it still brings a small touch of elegance to your room. The installation is very simple. The problem is that HDMI cables are not included and you will have to buy them separately (if you want to connect your TV or Blu-ray player through HDMI cables – HDMI connection is always preferred). After the installation, you can start using the unit by choosing one of the source options or you can try to program your TV remote or Blu-ray remote so you can use it to control the soundbar – you don’t have to do this if you don’t want to and if having separate remote for every piece of equipment doesn’t bother you. All the instructions on how to use TV remote to control the soundbar are in the manual (and you will have to connect TV to the soundbar through HDMI ARC connection). Once you connect and set up everything, you can start using it. Controls are really simple and intuitive. After selecting the source, you can adjust the volume, select one of the audio filters, shift between stereo and surround sound modes, adjust the amount of bass or mute the subwoofers (this comes in handy if you decide to buy an additional subwoofer), etc. YAS-107BL supports two types of surround sound – 3D surround and (regular) surround. 3D surround sound is a way of simulating different effects in order to make your listening experience more lifelike and it works with DTS:X object-based audio (you have to install firmware update in order to make your soundbar capable of playing this audio format). YAS-107BL also supports Dolby Digital 5.1 and DTS 5.1 surround sound audio. In surround sound mode you can choose one of the audio filters – Music, Sports, TV Program, Game, Movie. These different filters are in fact different EQ settings. In Music, Game, and Movie mode you will get more bass and treble, and in Sports and TV Program modes, you will get less bass, enhanced dialogues, and most of the background sounds will be isolated. The soundbar also features Bluetooth version 4.1 but unfortunately, you can’t connect it wirelessly to your TV because there is no aptX Low Latency codec support. You can use Bluetooth to stream music from any Bluetooth-enabled device. In Bluetooth mode, there is also an audio filter called Clear Voice that really improves the sound quality of streamed music by reducing the noise. In order to set up everything and control the soundbar, you can also use the Home Theater Controller app. The app is available for both iPhone and Android users. What is really interesting is that Yamaha already predicted that some of the users may not be happy with the amount of bass the unit produces and they included additional subwoofer output so you can extend your home audio system from soundbar to soundbar + active subwoofer. The thing that we have already mentioned is the bass response. It’s not like there is no low end at all. In fact, most of the time, you will be more than happy with the sound coming from the YAS-107BL. But in some cases, you will need a subwoofer to get the best possible sound. This unit struggled with bass heavy music and with some explosions and gunshots during movies and there was a noticeable distortion at higher volumes. In order to get more bass, we recommend buying an external bass unit and disabling subwoofers on the YAS-107BL. Depending on the type of TV and your TV remote, you may experience some issues when trying to program the remote in order to control both your TV and your soundbar with it. TaoTronics could be described as one of those companies that make affordable or even cheap products (Bluetooth speakers, Bluetooth headphones, Bluetooth soundbars) and offers decent value for the price. You should always have that in mind when buying TaoTronics product – you can’t expect it to sound like SONOS or Yamaha when it costs that much and you shouldn’t compare it to those products. If you have enough money to buy SONOS or Yamaha, you should definitely buy those instead of TaoTronics. It will never sound the same and that’s the only truth. That being said, we have decided to present to you a low-budget soundbar TT-SK15 by TaoTronics. It’s affordable and it offers some audio improvement compared to your TV speakers, but do not raise your expectations too high. These improvements are not that big if you have one of those huge 4K or ULTRA HD TV devices. If you have a smaller TV (30-40 inches), you will experience more noticeable improvement in loudness and sound quality. TT-SK15 comes in a cardboard box with just a few writings on it. Nothing premium about it but that’s expected when you buy cheap audio equipment. Inside the box, there will be your soundbar, power cable, RCA cable (yes, it’s RCA not optical), simple remote, user manual, and 1-year warranty card. The soundbar is 34 inches wide, 3.4 inches tall, 2.6 inches deep, and it weighs 4 pounds. It looks quite stylish – the front and top side are wrapped in some nice-looking fabric with an aluminum part with controls and LED status indicators in the middle. On the top panel, you will see power and volume buttons, and on the front panel, there are source button, standby/ON button, Bluetooth indicator, analog indicator (RCA – solid green, AUX – solid red), and digital indicator (Coaxial – solid green, optical – solid red). The input ports are on the rear panel – you can use two analog ports (RCA and AUX), and two digital ports (coaxial and digital optical). Digital optical input is always preferred connection but you will have to buy the cables separately since you won’t get any. The remote is really simple – there are only 4 source buttons + Bluetooth button, power and mute buttons, and volume and track management buttons. We are talking about the remote since you are probably going to use it – you can’t use your TV remote to control both TV and TT-SK15 unless it features Infrared learning function. The first thing that will draw your attention is the design. This thing doesn’t look worse than BOSE Solo 5 soundbar. It’s very stylish and compact. You won’t get the impression this is some high-quality device but it is visually appealing. Connecting the unit to your TV is quite simple – you can use one of the inputs depending on the output ports on your TV (most of today’s TVs feature only digital outputs so you will have to buy digital or coaxial optical cable). Using the soundbar is even simpler than connecting it. You can control everything from the remote controller. In order to control everything with one remote (your TV remote), that remote must feature Infrared learning function. This soundbar also features wireless connection through Bluetooth. You can’t pair it with your TV through Bluetooth because it doesn’t support AptX Low Latency Bluetooth profile. You can use the Bluetooth to stream music from Bluetooth-supported devices (phones, tablets, PCs). You can connect two Bluetooth-enabled devices at the same time. In terms of sound quality, this soundbar performs better than expected (if your expectations are not too high). Mids sound incredibly clean and articulate, highs are pretty good but the bass is really weak, it’s pretty much the same like on 30-inch TV. So, if you want to hear all those sound effects better, buy something more expensive. This soundbar will not make explosions and other sound effects much better. The first and the most important thing is the bass. This unit really lacks low end and you have to be aware of that. There is no way to improve the bass since you can’t connect another bass unit (subwoofer) to it. The unit comes with only one cable (RCA) and you are probably not going to need this one. You will have to buy digital optical or coaxial cable separately. You can’t use your TV remote to control the soundbar unless it features Infrared learning option. There are a few bad things about the Bluetooth. First of all, the range is shorter than 30ft and in some cases, the connection breaks for no reason. Also, the unit won’t remember your device after you turn it off and you will have to go through pairing process every time. Edifier is a Chinese company but it’s not like a bunch of others that make cheap products with mediocre quality. Edifier manufactures high-quality audio equipment (different types of speakers and headphones) for everyday and professional use. The company was founded in Beijing, in 1996. Edifier exists for more than two decades and it is one of our favorite brands when it comes to mid-end affordable products. 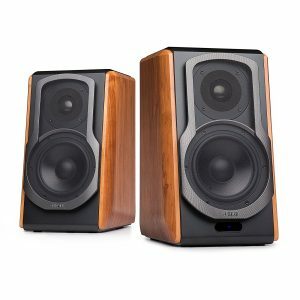 Edifier’s speakers are definitely not cheap but they maintain a perfect ratio between the price and quality. We have decided to present to you Edifier’s S1000DB bookshelf speaker with a Bluetooth connectivity. It’s one of the most expensive speakers made by Edifier but considering the performance, design, and bunch of connectivity options, you will have to admit that this is one of the best options under $350. If this is too much for you but you like the design, the performance, and Bluetooth connectivity you can always go for some cheaper option like Edifier R2000DB (one of the best under $250), or Edifier R1700BT or Edifier R1280DB (one of the best under $150). They are all comparable to the best wireless (Bluetooth) speakers within their respective price ranges. The best things about Edifier S1000DB are great audio clarity with detailed mids and highs, great loudness, a bunch of connection options along with Bluetooth connectivity, premium design with wooden finish, and simple installation and use. The biggest downsides are unresponsive remote buttons and maybe a bit weaker bass for our taste. The speakers come in a large and simple box. The presentation is not equally premium as the speakers but they are well-packed and protected and that’s the most important. Inside the box you will find one active and one passive speaker (they are both the same size but all the connection ports, as well as power supply input, are on the rear panel of the active speaker which also supplies power to the passive one), a simple remote, RCA to RCA cable, RCA to 3.5mm cable, digital optical cable, cable for connecting the speakers (this is not a regular speaker cable), user manual and 2-year warranty card. The speakers look incredibly stylish with a wooden finish on the left and on the right side and matte black finish on the top. The front side of the passive and active speaker is very similar – it’s covered with removable and transparent black grille and you can see the drivers through it. Depending on your taste, you can completely remove the grille and leave it that way. The only difference between two speakers is that the active one has IR receiver with LED status indicators at the bottom. LED lights will glow red if you are using digital inputs (coaxial or optical), green if you are using analog inputs (AUX or RCA), or blue if you are streaming music via Bluetooth. You will see the real difference between the two speakers if you look at the rear panels. The passive speaker has only one input on the back and it is used to connect it to the active speaker that sends power and audio signal to the passive one. The active speaker is a completely different story. On the rear panel of the active speaker, you will find 3 knobs (VOLUME/INPUT SELECTION knob, BASS, and TREBLE knobs), power switch, power cable (not detachable), analog inputs (RCA and AUX). digital inputs (optical and coaxial), and speaker output (for connecting the passive speaker). As you can see all the controls, inputs and outputs are on this speaker. You can use the volume knob to adjust the volume but you can also press it shortly to shift between different inputs or press and hold to disconnect Bluetooth device. You can connect multiple devices to the speaker (your PC, TV, DVD player, gaming console, etc.). Both speakers are 8 inches wide, 13.5 inches tall, and 10.5 inches deep, and each speaker weighs 18 pounds. Inside each speaker, there is one 5.5-inch woofer (in charge of bass and mids), and one 1-inch tweeter. Woofers are rated at 35W RMS and tweeters are rated at 25W RMS which gives you combined output power of 120W. Signal to noise ratio is greater than 85dB and frequency response spans from 48Hz to 20KHz. The remote is the least attractive part of the package. It looks like it was borrowed from some other speaker and it’s not a match with these elegant speakers. The remote is quite simple with only a few buttons – power button, volume and mute buttons, and three source buttons (Bluetooth, PC/AUX, OPT/COAX). The first thing you will notice is the elegance of these speakers. Majority of the manufacturers, even those famous audio equipment manufacturers (BOSE, Yamaha, Polk, Pioneer) switched from wood to plastic and it’s really refreshing to see a wooden finish on Edifier S1000DB. The look is so much improved this way. In general, wood also makes the sound better, but this is not the case here since the cabinets are made of plastic and then covered with wood. Still, that doesn’t mean that S1000DB sounds bad, we’re just saying that it would sound better if the cabinet is made of wood. The installation process is very simple and you shouldn’t have any problems connecting the speakers to your TV, PC, or any other device. In order to connect the TV, you should use either digital optical or coaxial inputs, and you can use LINE IN for your PC. After connecting all the sources, you should also connect two speakers together through provided speaker cable. After that, you can plug the active speaker into the wall outlet and turn it on. Make the initial volume, bass, and treble adjustments and you are ready to use the unit. Press one of the source buttons on your remote or press the volume knob to choose the right input and enjoy. These speakers feature Bluetooth 4.0 with aptX support (not aptX Low Latency – these are two different codecs; aptX reduces sound delay to 60-80ms and aptX low latency reduces it below 40ms) so you might be able to watch some video content on your Bluetooth-enabled device and stream audio to the speakers without noticeable audio delay. You might be even able to watch a movie on your Bluetooth-enabled TV and send the audio via Bluetooth to the speakers (but your TV also needs aptX support). The connection is stable and without signal loss. You can turn on the pairing mode by pressing Bluetooth button on your TV or by pressing volume knob on the active speaker. Now, let’s talk about the sound. Edifier S1000DB is one of the best in terms of sound quality and loudness on this list. The clarity and richness of mids and highs were surprising. These speakers are great for music but also for movies and TV shows. Voices are super-clean, there is no noticeable distortion even at high volumes. These two speakers are more than enough for a small room, they will be good for mid-sized rooms but you might want something stronger for large rooms. The only thing that wasn’t impressive was the bass and we are going to elaborate on this in the next section. Bass is simply not punchy enough but that’s something we have expected considering the size of woofers. In order to get rich, punchy, wall-shaking bass you need at least 8-inch or 10-inch driver and for that kind of driver, you need an even bigger speaker. That’s the thing about the sound – you need big speakers (cabinets) if you want big sound. Still, Edifiers offers a decent amount of bass for its size and we can’t complain too much about that. There is also a thing about the remote we don’t like. The buttons are not responsive and you have to press them twice or three times to get the input you want or to adjust the volume. VIZIO is an American electronics manufacturer. It was founded in 2002 and, since then, it’s been growing constantly. The company is best known for its TVs but they also make mobile phones, tablets, soundbars, speakers, and home theater systems. Their audio equipment is definitely not high-end. They mostly make entry-level soundbars and home theater systems. Some of their soundbars and home theater systems can be considered mid-end but that’s it. This is something you should always have in mind when purchasing VIZIO audio equipment. If you are looking at some low-budget entry-level soundbar, you can’t expect it to be perfect. We have decided to present to you VIZIO soundbar –SB2920. It’s one of the most popular soundbars on the market. It’s low-budget but it doesn’t look like that. Its design is minimalistic but that doesn’t have to mean anything (Bose Solo 5 has similar design and it costs 4 times more). You have all the necessary inputs and even a subwoofer output. The greatest highlight in terms of sound quality is the reproduction of mid-range frequencies. Besides that, we loved its loudness Bluetooth connectivity, and simple installation process. We were not impressed by DTS TruSurround and DTS TruVolume. We were also not completely happy with the ease of use (we have experienced some issues regarding LED status indicators, remote, and source changing) but the worst thing was the bass – it is incredibly weak, almost nonexistent. Maybe that’s why VIZIO included subwoofer output so you can add a subwoofer to the soundbar and get much better listening experience. The soundbar comes in a nice box with a bunch of additional equipment. Along with the soundbar, you will get a remote, power adapter, digital optical, coaxial, RCA to 3.5mm cable, wall mount brackets, screws, and template, a quick start guide, and 1-year warranty card. The soundbar itself looks minimalistic but very elegant. It’s completely wrapped in some kind of acoustic cloth. On the front side, in the left corner, there are 12 small LED status indicators. You will get a different combination of LED lights glowing or flashing depending on the source but you really have to get used to this kind of indicators since there is no sign next to each LED saying this is an optical input and this is Bluetooth. The control buttons are on the top panel. You will see five buttons – power ON/OFF, INPUT (for shifting between different sources connected to the soundbar), and two volume buttons. All the connections are on the rear panel. You will get power input, optical and coaxial inputs, RCA and AUX (3.5mm) inputs, USB input (this one is kind of useless since you can play only WAV audio format from a USB stick), and a SUBWOOFER output (if you decide to buy a subwoofer or you already have one (it has to be powered subwoofer) you can connect it and expand from 2.0 to 2.1). The soundbar is 29 inches wide, 3 inches tall, 3 inches deep, and it weighs 4.5 pounds. Inside the speaker, there are two 2.5-inch full-range drivers (this is basically 2.0 stereo sound system). Drivers are in the left and right corners (which is a better option than placing both drivers in the middle like BOSE did with its BOSE Solo 5). The soundbar can reproduce frequencies ranging from 70Hz to 19KHz and the maximum SPL is around 95dB. The remote that comes with the soundbar is quite simple and you will get used to it in no time. The bad thing is that you won’t be able to use your TV remote to control the soundbar unless you have VIZIO TV (you have to press and hold the power button and VOLUME + button simultaneously for five seconds if you want to use VIZIO TV remote to control SB2920). There is a possibility that your TV remote will work with the soundbar without any additional settings, but VIZIO doesn’t provide any info on this. So, it’s better to assume that you won’t be able to use TV remote to control the soundbar and you will have to use SB2920 remote. With this remote, you can turn on or off the soundbar, choose input or go to Bluetooth pairing, adjust the volume, control the playback (in Bluetooth mode), activate DTS TruVolume (TVOL button) or DTS TruSurround HD (TSHD), mute the unit, or adjust the bass or treble. There is nothing we would like to change when the design of this soundbar is concerned. It’s really interesting how something simple as SB2920 can look so elegant. The setup of the unit should not take more than half an hour (even if you want to mount it on the wall). As you already know, digital connections are always preferred (unless you have 10 years old TV without digital outputs – in that case, you will have to use either RCA or AUX inputs). Controlling the unit after the setup could be a bit annoying – it’s not complicated but you need to be patient since the unit needs some time to switch from one to another input. The soundbar features a Bluetooth connection and you can use it to stream music from your Bluetooth-enabled devices. You can’t connect your smart TV to the soundbar wirelessly via Bluetooth and watch video content since it doesn’t support aptX low latency (sound delay is too big). Pairing is simple (you just have to press Bluetooth button on the remote or on the soundbar, find SB2920 on your phone, tablet, etc. and pair them). When it comes to sound, we can’t say that we were impressed or blown away. If you have 30-50’’ TV, this soundbar will definitely be an improvement compared to your TV speakers. One more good thing we have to notice is that voices and mid-range frequencies really sound loud and clear, even at high volumes. You already know that SB2920 has two 2.5-inch full-range drivers. So, you will basically get 2.0 stereo system but there are two interesting modes that you can activate if you want a simulation of surround sound – DTS TruSurround HD and DTS TruVolume. These two features don’t really make some significant improvement. You can’t expect something with only two small drivers sitting in front of you to imitate cinematic surround sound experience. The good thing is that you can always add a subwoofer and we strongly recommend buying one. You will get much better listening experience with it. Soundbars, in general, are struggling with bass but not all of them have a subwoofer output. In fact, there is a small number of soundbars that support additional subwoofer and this is one of them. We should probably talk about the sound issues first. SB2920 really lacks depth. It’s not like the bass does not exist. It’s there but it is far from being decent. You can adjust (add) the bass through the remote, but the reproduction of mids will suffer a lot. The soundbar also lacks some high frequencies but that’s not a critical issue. It could become if you try to adjust the treble and increase it. Distortion is really noticeable when you bring the treble up and increase the volume above 70%. We have already mentioned that the unit needs some time to change the input. In some cases, you might even have to turn it off and back on in order to change the input. Built-in hardware (or software) is slow and you will have to be patient and wait a few seconds after pressing the input button so the unit could shift between the inputs. Some customers also complained about the Energy Star (power saving) mode. The unit will turn off if there is no audio signal for some time. In general, that’s a good thing but you probably don’t want it to turn off if there is no signal for a few minutes. In order to deactivate Energy Star mode, you can press and hold simultaneously Power button and Volume – button for five seconds. We have decided to end this list with one of the best soundbars on the market made by ZVOX. ZVOX is a small company founded in Massachusetts in 2003. A group of former Cambridge SoundWorks employees led by Tom Hannaher (the CEO of the ZVOX) decided to start their own business. ZVOX is one of the pioneers when it comes to soundbars and sound base home theater systems. One of their first soundbars (model 315) was the first soundbar ever to become a bestseller and from then on other companies like Yamaha and BOSE started making their own soundbars. ZVOX wasn’t the first company ever to make a soundbar but their ZVOX 315 was the first one that made a success. In 2008, ZVOX made the first ever sound base – low profile cabinet with a bunch of drivers packed inside in order to offer perfect home theater sound in one small device that goes under your TV. In 2012, people from ZVOX came up with a hearing aid feature called AccuVoice. We have already talked about voice enhancement features on other soundbars (SONOS, for example) but AccuVoice offers much better enhancement and voice clarity than any other soundbar we’ve mentioned. If you need something to help you hear all the dialogue properly or if you are heard of hearing, any of the ZVOX soundbars is a good choice. We are going to talk about one the largest soundbars made by this company – ZVOX SB500. This soundbar is the perfect example of what to expect from all ZVOX devices. You will get a stylish all-black aluminum cabinet with 3 full-range woofers and 2 built-in subwoofers powered by digital class-D amplifiers with a combined power of 140W. 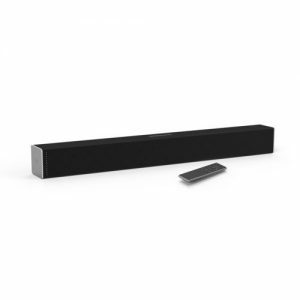 The best features of this soundbar are extraordinary build quality, great sound quality (when it comes to soundbars, this one is comparable only to SONOS PLAYBAR), AccuVoice and Output Leveling features along with different surround settings, digital inputs, Bluetooth connectivity, and subwoofer output. We didn’t find a lot of bad things to complain about – the remote and the display look like they came from the 1980s and some improvements in this area could be beneficial. Still, both the remote and the display are functional and you will just have to get used to them. Bass on this device is better than on any other soundbar we’ve reviewed but you can’t expect extremely deep and rich lows. That’s why you have the option to expand this system by adding a powered subwoofer (preferably one with a low-pass filter). The soundbar comes in a simple cardboard box. The presentation doesn’t really match ZVOX 500 quality but everything is nicely packed and protected and that’s the most important. Along with the soundbar, you will get a power cable, RCA to RCA cable, RCA to 3.5mm cable, digital optical cable (TOSLINK), safety instructions, user manual, wall mounting brackets, a cardboard wall mounting template, and 1-year warranty card. The soundbar looks incredibly compact and sturdy. It’s not made of plastic like most of the other soundbars on the market (even those expensive ones). ZVOX decided to go with aluminum instead of plastic and that’s a huge improvement. This thing really looks more durable than any other soundbar on this list. The front panel is covered with an aluminum grille. The old-school 4-digit display is located in the right corner of the front panel. You will have to read the manual in order to understand the writings on the display. The left and right ends of the soundbar are rubberized. On the right end, you will see four huge control buttons – power button, 2 volume control buttons, and an input button. On the left end, there is one passive radiator. The rear panel is also made of aluminum. In the left corner, you will see all the connection ports – RCA input, two digital optical inputs (there is no coaxial or HDMI input), power input, and subwoofer output. The soundbar is one of the biggest on the list. It’s almost 44 inches wide, 3.3 inches deep, and 5.7 inches tall and it weighs about 13 pounds. Inside the soundbar, there are 3 2-inch full-range woofers, and two 4-inch subwoofers. They are all powered by digital class-D amplifiers (combined power – 140W). Frequency response is 42Hz to 20KHz. The remote looks like it came from the past but it works. You can use it to turn on/off the soundbar, shift between 4 different inputs (one analog, two digital, and Bluetooth), turn on the AccuVoice feature, choose one of the three surround sound modes, adjust bass and treble, adjust or mute the volume. The good thing is that you can use your TV remote or a universal remote to control the basic things like the volume. SB 500 is a perfect example of great workmanship, there is no doubt about that. Everything is made of aluminum. It looks simple and elegant and we couldn’t ask for more. Installation is smooth and quick. You should decide whether you want to mount it on the wall or place it on a tabletop (two possible positions – face front or face up). Depending on the position, you should choose a different type of sound profile from the PS menu. PS menu is a tool that you can use to make different adjustments (sound preferences, remote emulation modes for different TV brands, etc.). You can activate this menu by pressing Power and Volume Up button (on the unit itself, not on the remote) for five seconds. If you mount the unit on the wall, you should choose PS18, if the soundbar is in face up position choose PS17, and if you choose face front position, you should go with PS16. Once you set everything up, you can enjoy perfectly clear sound. SB 500 also features Bluetooth with aptX support so you might be able to watch some video content on your Bluetooth-enabled device and stream audio to the soundbar without noticeable audio delay. You can also stream music from all the Bluetooth-enabled devices. This unit offers better sound quality and clarity than any other in this price range. As we’ve said multiple times, the greatest highlight are the dialogues. The reproduction of all the mid-range frequencies is perfect, there is a lot of detail and richness. On top of that, this unit, unlike many others, can really produce some bass. It’s not perfect, and it won’t leave you speechless, but you can’t expect a mind-blowing bass from a soundbar anyway. Highs are quite good but lack some clarity. All in all, SB 500 is one of the best soundbars when it comes to sound quality. ZVOX SB500 also simulates surround sound. You can choose one of three surround sound modes – Sd1 is designed for people who want better voice clarity and a small amount of virtual surround sound, Sd2 is designed for TV program, and Sd3 for movies. We were not impressed by these surround modes but you should be aware that no soundbar can simulate surround sound and create a perfect cinema-like experience. There is also the AccuVoice feature. If you decide to turn it on, surround sound mode will be turned off. This feature extrapolates voices from the soundtrack, improves their clarity through algorithms and then mix the voices back with the soundtrack. That way, all the dialogues are boosted and background sounds are reduced. Another feature we would like to mention is the Output Leveling. This feature basically levels the volume by boosting quiet outputs and reducing loud outputs. It comes in handy during the commercial breaks, but it’s not perfect and we preferred watching movies with Output Leveling turned off. The only bad thing we could say about this unit is that you may not be perfectly happy with the bass. The good thing is that you can improve overall experience by adding a subwoofer to the system. Without the additional subwoofer, this unit is not a great choice for music, but it is perfect for any TV content. This was our list of 10 best wireless speakers for TV. We hope you found something that suits your needs and your budget. If you didn’t find the right speaker for your TV on this list and you are planning to keep on with your search, we have a few pieces of advice for you. Read them and make your search much easier. Some characteristics are more important than others and we are going to list all the important ones and tell you what to look for when buying wireless speakers for TV. When it comes to speakers for TV, you don’t really need a perfect audiophile experience and perfectly balanced sound (flat frequency response). If you are hard of hearing, you are going to need a speaker that’s able to enhance some frequencies (voices and dialogues, for example). If your hearing is fine and you just need something that’s going to improve your listening experience and immerse you in the content you’re watching (movies, series, etc.) you will need something with a stronger and punchier bass (in order to bring all those special sound effects to life). It all depends on your needs. As you already know, there are three types of wireless speakers – RF, Bluetooth, and Wi-Fi. Assuming that you already have a TV, your choice will partially depend on your TV’s features. If you have a TV with built-in Bluetooth (with aptX low latency support) you might want some Bluetooth speaker rather than Wi-Fi or RF speaker. If you need something that would enhance some frequencies (voices and dialogues), the first three (RF) speakers on the list are pretty good choices for you but as you have seen, many Bluetooth and Wi-Fi speakers also feature dialogue enhancement modes. Wi-Fi speakers don’t really require a smart TV with Wi-Fi connectivity. You will need a wireless router and Wi-Fi connection but you won’t need a TV with Wi-Fi unless you want to buy a set of wireless speakers designed especially for your smart TV. TVs with Wi-Fi connectivity do not send sound wirelessly to your speakers. The TV is usually connected to one of the speakers (or to a soundbar) through wires (TV is not the transmitter), and then, that speaker (or soundbar) transmits the sound to other (wireless) speakers via Wi-Fi. Even though we are talking about wireless speakers, it’s really important to have one or more input ports. The most important input ports you should be looking for are digital optical input, coaxial input, 3.5mm AUX port, and RCA ports. If you are buying RF speaker you should always check which inputs are available on the base and which outputs are available on your TV (usually, you will have to use AUX or RCA). If you have a Bluetooth speaker (and if it features aptX low latency support) and a TV with built-in Bluetooth (with aptX low latency support), you don’t really need any wires and inputs but it’s always nice to have a backup option. Wi-Fi speakers (especially the unit that gets connected to your TV) usually have one or more inputs (digital optical, coaxial, RCA, AUX, etc.). You should be looking for a wireless speaker with as many inputs and outputs as possible – they are wireless but having one or more inputs and/or outputs won’t hurt. This feature is mostly related to Bluetooth and RF speakers. Wi-Fi speakers are usually plugged in all the time and you can use them only indoors (after all, they use your home Wi-Fi network and even if they had a battery you won’t be able to use them outside your home). Bluetooth and RF speakers have batteries and most of them are portable which means that you don’t have to use them only indoors. If you want to move them around your home and you don’t want to keep them plugged in all the time, you will need at least 5 hours of battery life. Most of the battery-powered speakers on our list offer more than that. If you are planning to upgrade your speaker system and buy additional speakers (or a subwoofer) in the future, you will have to know if it’s possible to make that kind of an upgrade. Some Wi-Fi speakers allow upgrading to 5.1 home theater system. With some Bluetooth speakers, you have the option of adding an additional speaker in order to get stereo sound or adding a powered subwoofer. Some RF transmitters can send the signal to multiple (up to 50) RF speakers (receivers). This could easily be the first thing you should think about. The price of wireless speakers varies a lot – from $100 (or even less) to $1000 (or more). Your budget is always a decisive factor. Price of RF speakers spans from $100 to $200. Bluetooth speakers are maybe the most affordable option, but you can easily find some Bluetooth speakers and soundbars that cost much more than $200. Wi-Fi speakers are the most expensive type of wireless speakers. Some Wi-Fi speakers cost even more than $1000 and if you want to buy a Wi-Fi home theater system (5.1), you will have to pay $2000-$3000 (or even more). Wireless speakers have been available for more than 10 years and they are getting better every day but still, if you need a great audiophile experience you should always go for wired ones. In order to transmit some hi-fi audio wirelessly (especially via Bluetooth), that audio has to be compressed and due to compression, some of the quality is lost. When you transmit audio through wires, there is no such compression and the audio quality stays unchanged. Some Wi-Fi speaker systems came close to that kind of audio quality but wired speakers are still a much better option in terms of sound quality (and they are also cheaper). The simple answer is – USUALLY NOT. All these wireless speakers need wires. Some of them have base (charging station) that has to be connected to your TV and has to be plugged into the wall socket all the time (like RF speakers). Wi-Fi speakers have to be plugged in, too. Bluetooth speakers offer the greatest freedom and portability but even they have to be charged (battery can’t last forever) and you are going to need wires to charge them. Some Bluetooth speakers (and soundbars) don’t even have batteries and have to be plugged in all the time. Solo 5 from Bose is my favorite!